A series of commemorative events took place in Dudley, West Midlands, to mark 60 years since Manchester United footballer Duncan Edwards died in the Munich air disaster. Black Country football legend Duncan was one of eight players killed in the crash, and was just 21 when he died on 21 February 1958. The town’s archives centre in Tipton Road, Dudley, has a special book of remembrance which forms part of an extended exhibition on the site, open for three months. A service of remembrance took place at St Francis’s Church, where there are two stained glass windows celebrating Duncan’s memory. 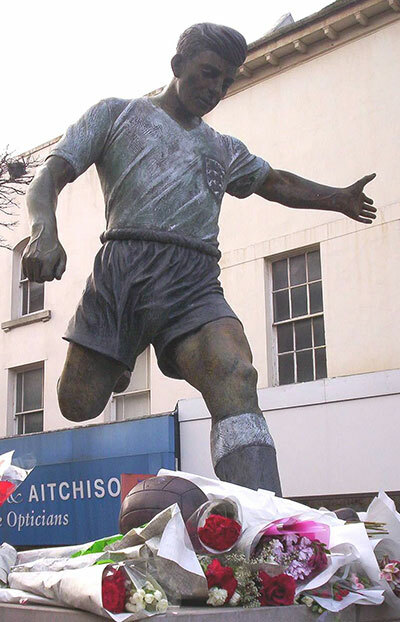 A party of some 80 Manchester United fans attended and also visited his grave at Queen’s Cross cemetery, and viewed Duncan’s statue in the town centre. A wall of remembrance has been set up at the church, where his funeral was held.